As a kid, I had plenty of dreams. I yearned of flying, meeting Charlie Sheen (for real; I blame Lucas, Ferris Bueller’s Day Off, and Major League), becoming a veterinarian (fail), becoming a music therapist (closer! ), traveling the world, learning the cello. 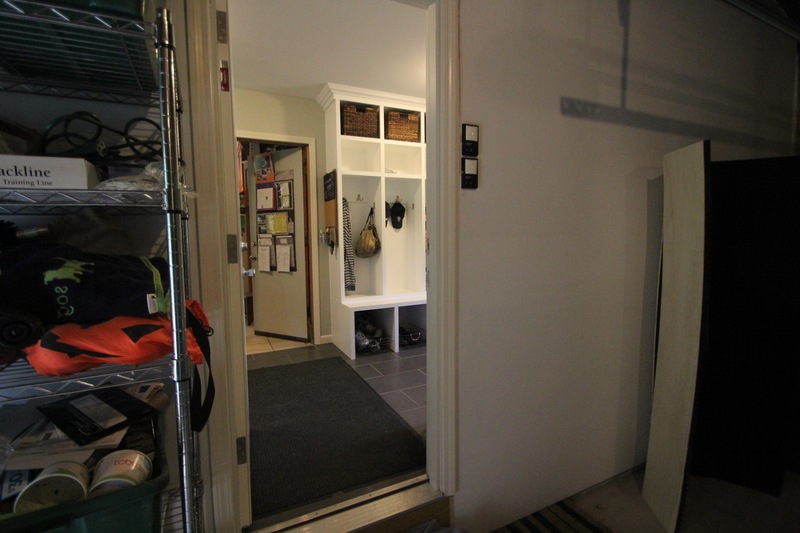 If I could talk to my younger self, never once would I have believed, at 40, that one of my greatest dreams would come true… and it would be having a mudroom. Sometimes, a girl has to go big or go home. We’ve loved our house since moving in nine years ago; it’s just the right size for us, and felt especially just-right after The Great DeClutter of 2015. Still, “just right” means “jam-packed” and “not a lot of storage,” plus the house lacked a practical entryway. 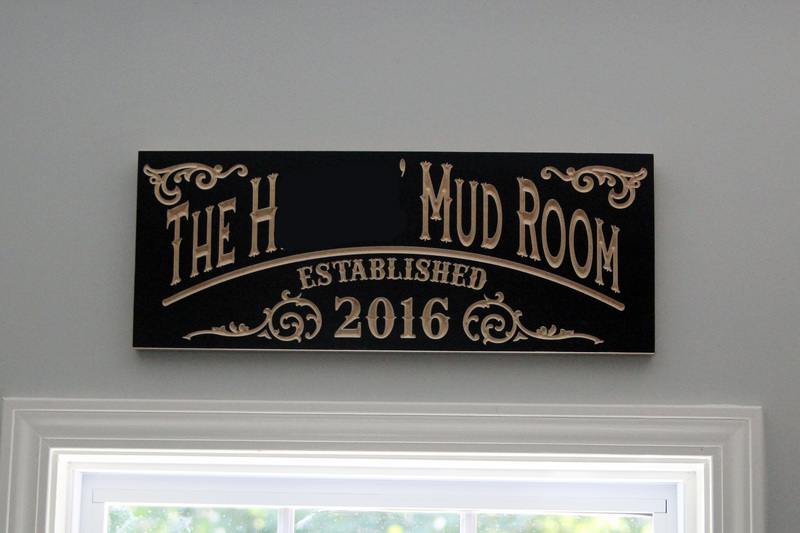 Rochester mud season lasts approximately 14 months a year. ‘Nuff said. 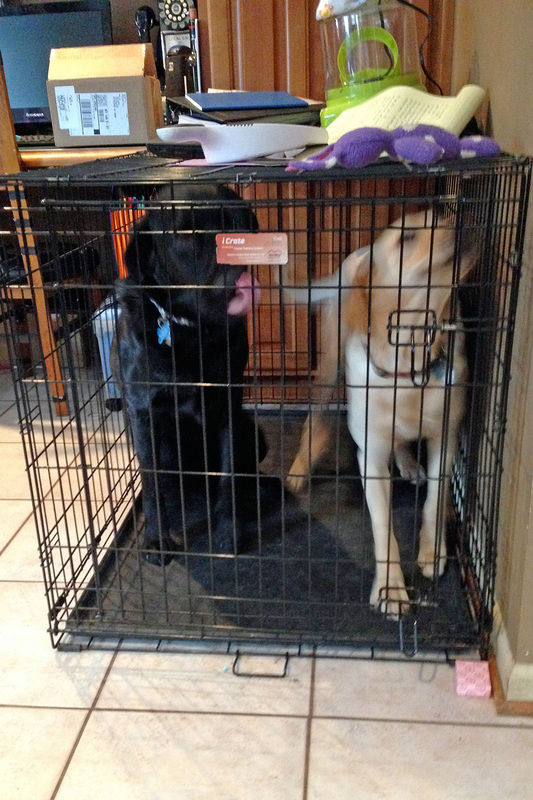 The dog kennel started off in the kitchen – a fur trap that also took up a heckuva lot of space. We eventually moved it to the dining room… where it was still a fur trap and also encouraged us to use it for storage (see above: baskets, boxes, and guitar cases on top of the kennel that’s squished in the corner). … but it was still a pain having to cross-reference the kitchen and the front hall, not to mention that, organized or not, as the girls g0t older and their stuff got bigger, the front hall seemed to shrink. 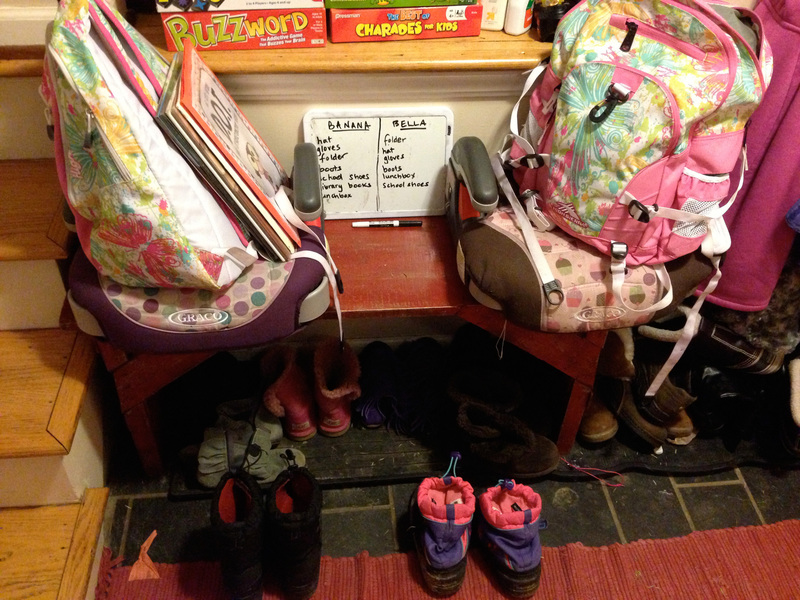 And then there were these brilliant organizational hacks. 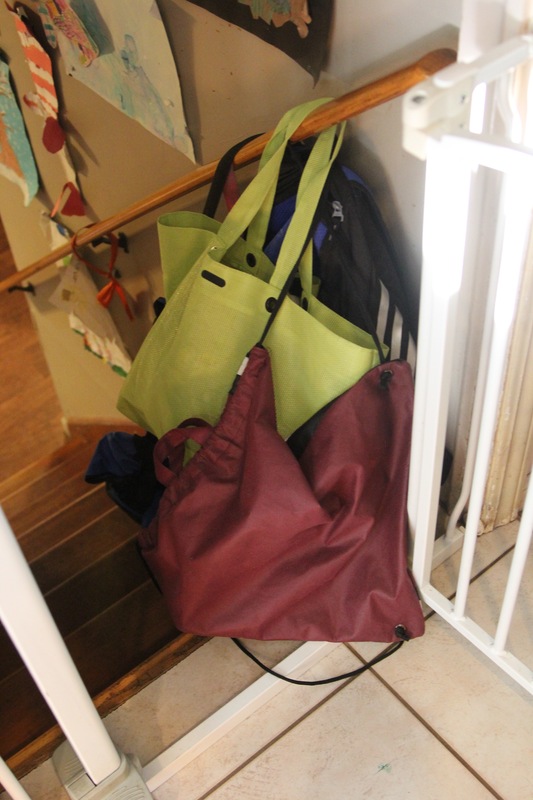 Sports bags hanging from the railing – an improvement, believe it or not, from storing them in the dining room. 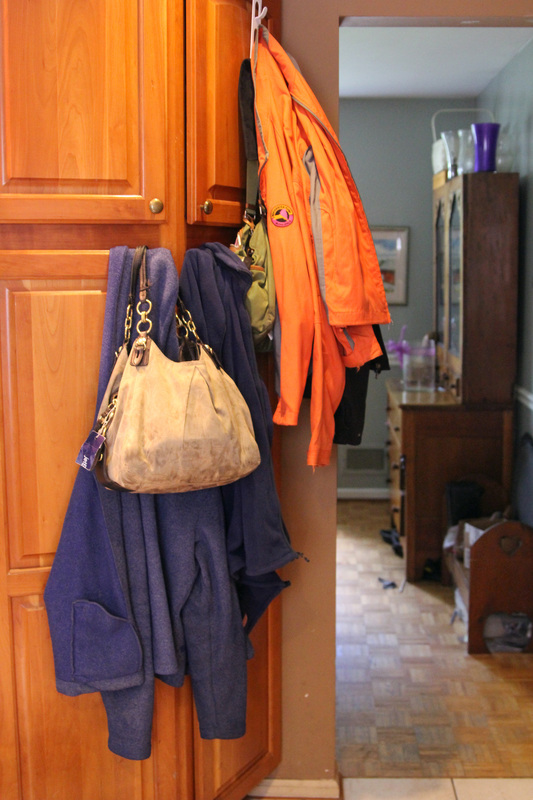 Nick’s and my coats (and purses) hung on the kitchen cabinets just inside the garage door. Note the white multi-hook-thingy upon which the orange jacket is hanging; WE TRIED, Y’ALL. Since forever, my grandma (Phoofsy) would bemoan that our house was too small for us. Every visit, we’d hear the same refrain – not enough space, too much stuff – and were told that, really, we needed to move. Since forever, we’d laugh and assure her that our house was perfect for us – if we only had a mudroom, all of our woes would disappear. You ask, CAN ONE ROOM REALLY BE SO MAGICAL? 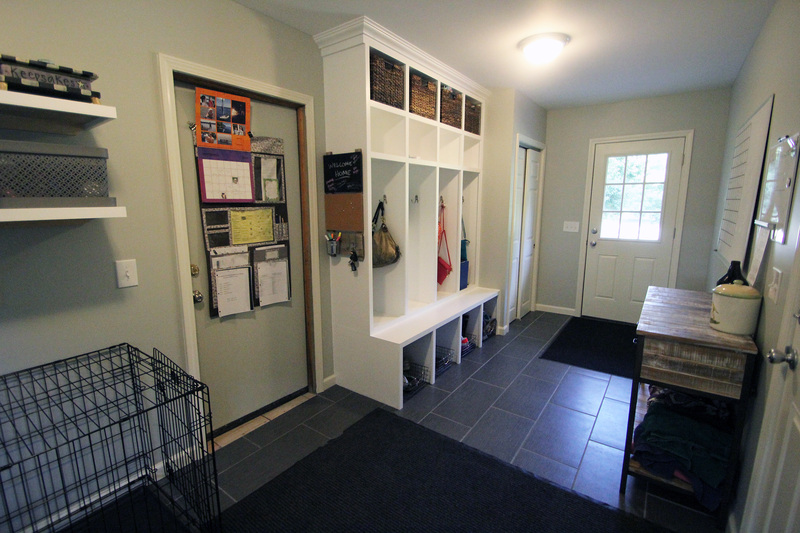 This – wanting a mudroom – began as a one-off statement, became a pipe dream, and eventually took over our fanciful If We Could Afford It discussions. 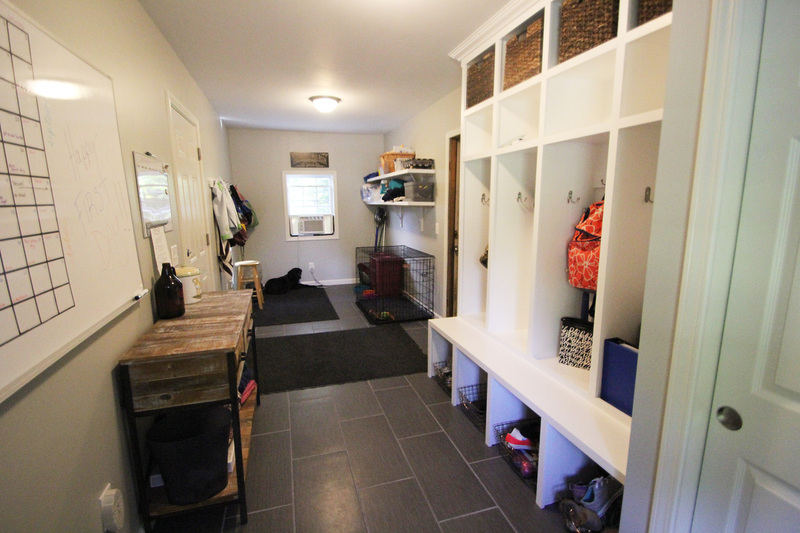 As “wanting a mudroom” stretched on for years, it became a real goal. I researched. I schemed. I pinned. I pined. 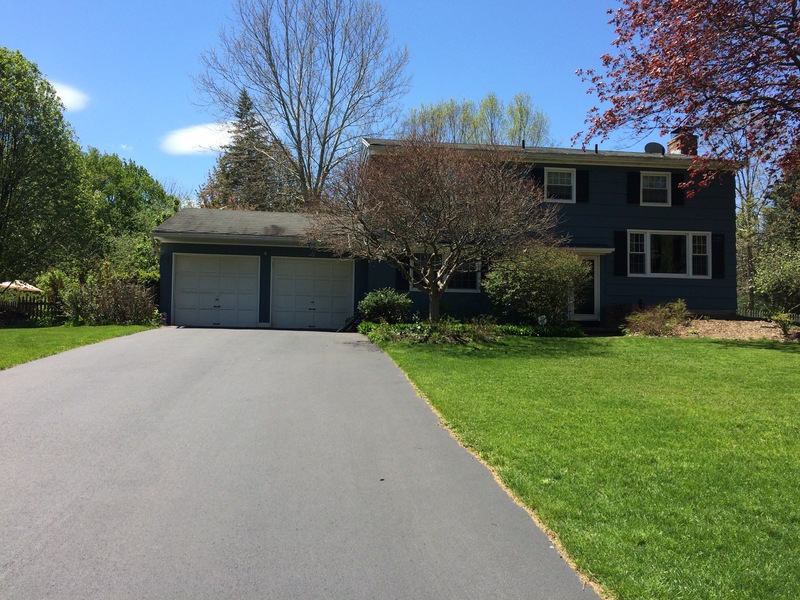 At last, after saving and planning and designing and meeting with architects and contractors, we began our formal house addition/remodel this past spring. Folks, angels rode unicorns across the yard. You probably heard our jubilation from wherever you are. 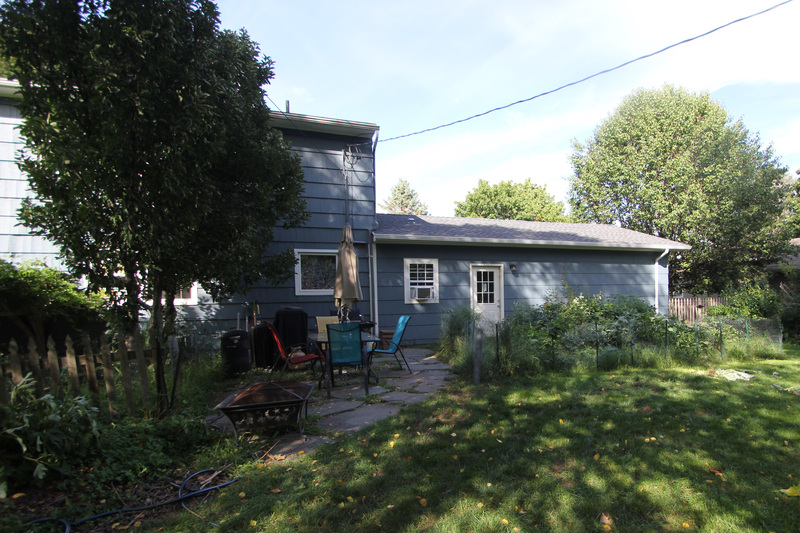 … to this (garage “moved over” and a mudroom inserted between it and the kitchen). The outside is so lovely, you guys! 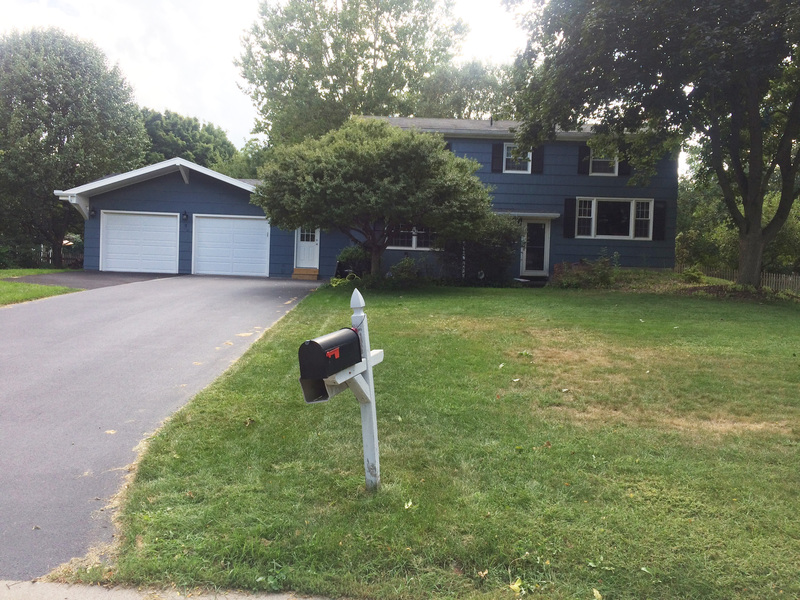 The contractor (who was amazing) matched the paint perfectly, there are new gutters everywhere. and the roofline is so cool. And now we have a plain white door that is just begging to be decorated for the fall (and Christmas and Valentine’s Day and if I can find anything that screams Winter Solstice you bet I’m gonna do it. Pinterest page: added). No, we still haven’t removed the sticker from the door’s window. Why rush? 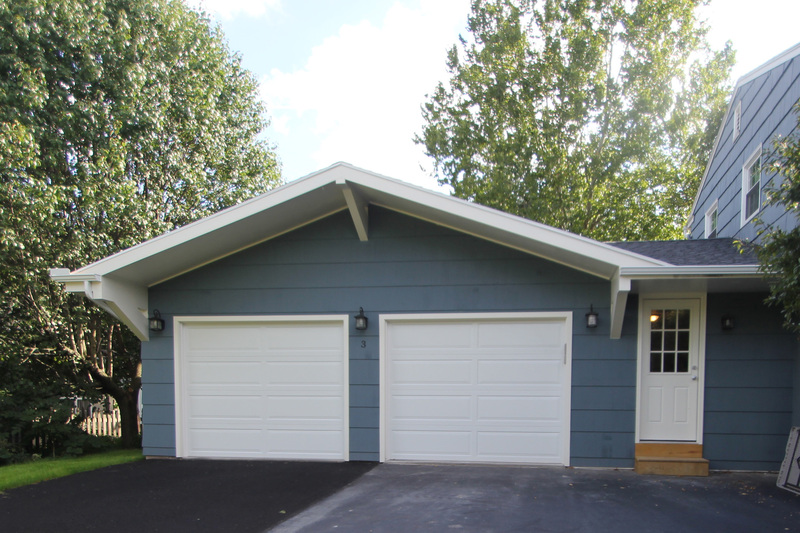 We hadn’t felt that there was anything wrongwith the original garage interior – but the final plan more or less called for a full remodel. Considering that we didn’t even know our garage was lacking… this is pretty fantastic. Aside from looking clean and shiny, the best part is that it’s a few feet wider, which means we can fit both cars (at the same time – holla!) and the scooter and even open all four doors on both cars, something that was previously impossible. HAVE MERCY. 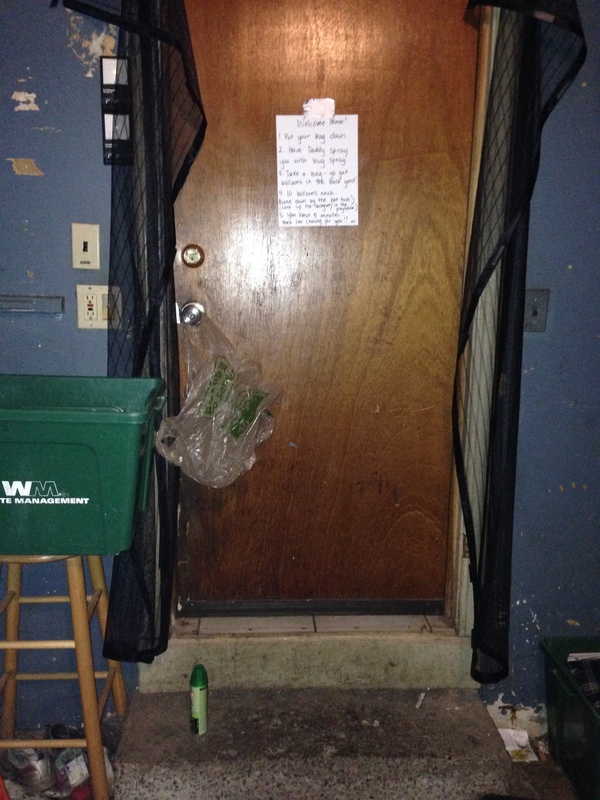 … we now have smooth, pristine walls – and a new, up-to-fire-code door (important, no?) 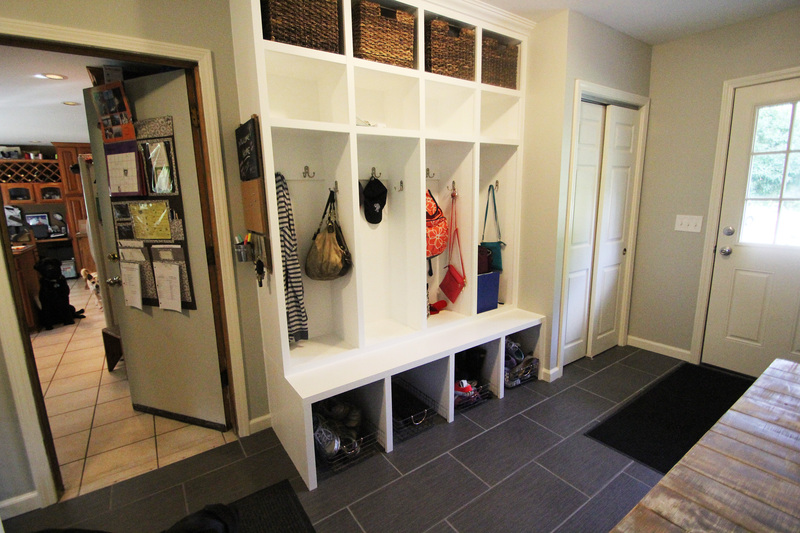 leading into the mudroom (!!). You can kind of see it, can’t you?? Is it not already incredible?? 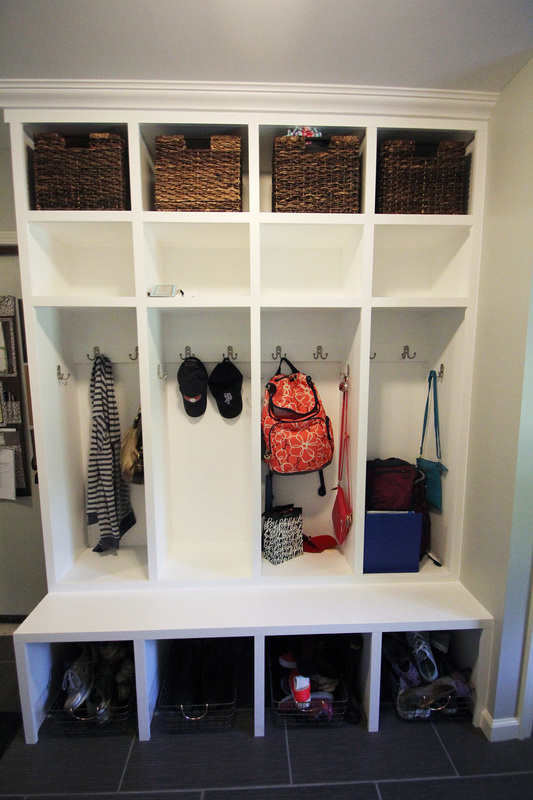 The mudroom itself, complete with cubbies (omg!!) and shelves and a closet and hooks and cubbies (have I mentioned the cubbies?). Due to other projects, our contractor had to finish this part nearly two months after completing the rest of the construction… But Sweet Fancy Moses, was it worth it. Are you ready?? Okay. Deep breaths. 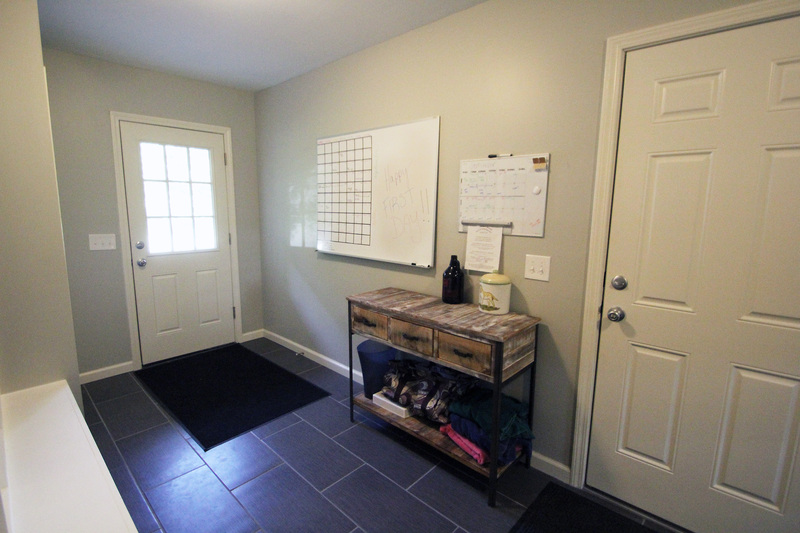 After all the searching and measuring and pinning and discussing and dreaming, I present you: The Mudroom. Not gonna lie: I feel like a better human being when I’m in this room. Look! 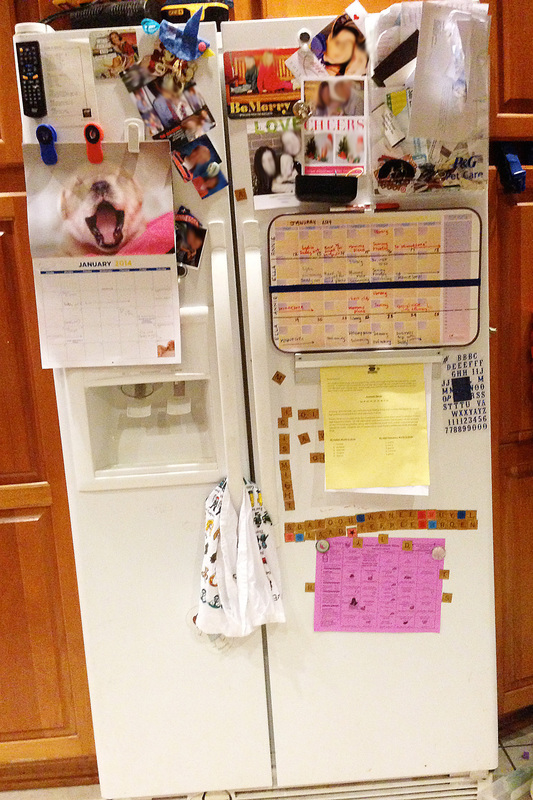 All of the girls’ school papers are now in one spot (omg) on the kitchen door; no more checking in several locations! My favorite little nook is the corner where the cubbies meet the kitchen door because of the adorable chalkboard/corkboard/keyhook thing that Nick hung. The dog kennel is on the left (no longer in the dining room – HALLELUJAH), with our dog accoutrements on the shelves (!) above it, along with the paper towels and toilet paper (no more garage-dusty cloths, thanks). After moving everything, we even have a whole empty cupboard now. We are so fancy. And the cubbies. THE CUBBBBBBBIIIIIIEEEEESSSSS. I sometimes contemplate curling up and just sleeping right here, it’s that beautiful. Do you know what there is space for? ALL OF THE STUFF. We – every one of us – has room for our coats, hats, bags, shoes, winter gear, and whatever else our hearts desire. In one place! CAN YOU IMAGINE!! That door over there with the windows is the cute white one which leads to the driveway (and the Arbor Day decorations). Between the doors? The new space for all of The Systems! Family calendar, kids’ calendar, extra room for holding papers and writing notes and drawing inappropriate pictures! Hot diggity dog!! That superb little table was a Home Goods steal that makes us look all reclaimed wood chic (that’s what I’m telling myself). Here’s the view when you walk in from the driveway (after passing the Grandparents Day decorations). The stuff on shelving in the back isn’t pretty, but man, is it functional. Oh – and now we’ve got loads of hooks on which to hang our bathing suits, towels, sports bags, and snowsuits. Go ahead. Pin it. I am. The pièce de résistance? This delicious sign (above the window), courtesy of my mama. Not only is the room SO SO SO PRETTY and functional and SO LOVELY – it actually does what it was intended to do! All of our outdoor things are finally in one place! The dog stuff is together – and nowhere near where we eat! Our railings are clear enough to actually grasp! The school supplies are easy to see and find! It feels tidier, smarter, like we can actually handle life’s hard things and have fun in the process. We finally have some space in the rest of our abode to feel a little less boxed in; the entire downstairs feels like a different, spacious home, which is its own bit of marvelous sorcery. And the kitchen floor? NOT. DIRTY. Because the dirt gets trapped in the mudroom (obvs). So, no. It’s not the cure for cancer or de-stigmatizing mental illness or saving refugees. But this one room has made our just-right house as perfect as we ever imagined; and, in so doing, has made us as happy here as we’ve ever been. Phoofsy would be giddy. If you can’t find me, I’m probably in the mudroom. We may even celebrate Thanksgiving in there. Come on over; we’ve got places to hang your coat! To school, or not to school… That was the question. For the past two days, both Annie and Ella have been home, sick… but it was that kind of sick where you wonder if they’re pulling early Ferris Buellers on you or if they’re really down and out enough to stay home. Don’t get me wrong – I would not wish serious illness on either of my children – but when that temperature rises over 100*F or there’s vomiting going on, at least you can be sure of whether or not they really need to stay home. Other times – like these past couple of days – it’s a lot more nebulous. On Friday, Annie began showing signs that she was coming down with something. As we went out that night with a few other friends and their moms, I told them that I suspected that Annie’s cough was more than just an annoyance. Sure enough, 36 hours later we found ourselves in our pediatrician’s office during their Sunday morning emergency visiting hours with a diagnosis of bronchitis (or possibly walking pneumonia). Y’all, Annie was miserable. There were times when she coughed so hard and so uncontrollably that I was actually worried she might break something. Two inhalers, Delsym doses, Benadryl, pain relievers, honey, tea, and Vicks VapoRub did almost nothing to alleviate her symptoms. 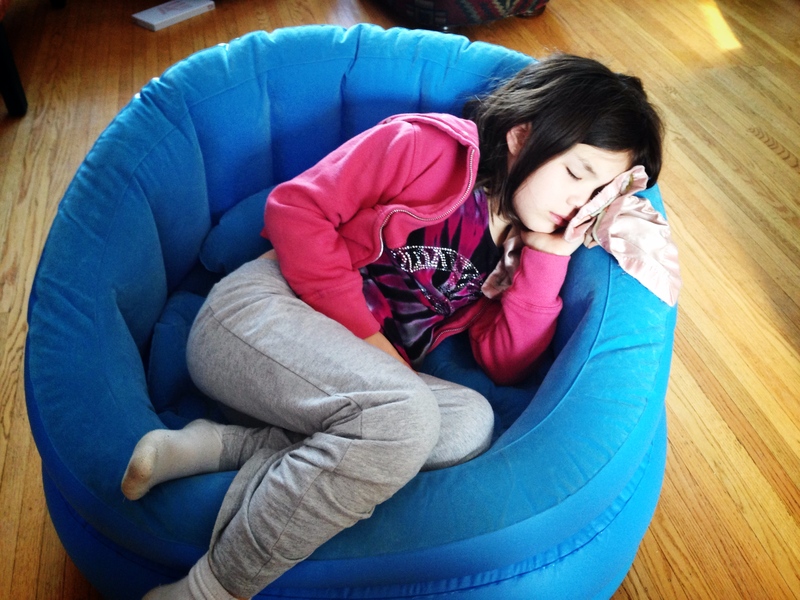 The poor girl was coughing too much to sleep; after crawling into my bed at 5 a.m. on Sunday morning following a horrible night, she caught only an hour of fitful sleep before awakening and rushing to the bathroom to be sick. She coughed so much and so violently during the day, she became totally exhausted; she physically hurt. We knew she wouldn’t be in school on Monday. Little sleep on Saturday night leads to napping on Sunday. Ella, by contrast, did not have anything so easily diagnosed. Her throat hurt and her nose was crazy stuffed but the pediatrician confirmed that it didn’t look like strep; lack of a fever or any other strep symptoms all point to a regular head cold. Colds are tricky, though; like prairie dogs or TV shows on Nick Jr, they’re deceptive – one moment, you think they’re harmless, and the next they’re destroying your lawn, causing your children to speak in nonsensical and exceedingly annoying catchphrases, and making your nose run so much you go through an entire box of tissues. When I picked up Annie’s antibiotics on Sunday, I decided to stock up on any and all accoutrements we might need to get the girls through the next few days. The pharmacist asked if I was purchasing the entire OTC aisle; I said I was and he agreed it was wise. Yesterday morning, Eleanor bemoaned her achy throat and can’t-breathe nose but, without a telltale fever or spreading rash or oozy eyes, Nick and I couldn’t really see any reason not to send her to school; just not feeling good is hard to quantify and even harder to use as a definitive get-out-of-school-free card. We told her that we believed in her – she would be okay! Ibuprofen and kids’ generic Cold And Sinus medication would help her out! – but if she really felt awful, she could go to the nurse and have her call me (I’d be home with Annie, after all) and I’d go and get her. When the phone rang at 10:08 a.m., I knew immediately what was up. Admittedly, she didn’t look so good; she was droopy and her eyes just looked off. For the rest of the day, while Annie hacked up a lung and essentially went on a hunger strike, we three lounged around the living room — watching TV (we expunged NBC’s live version of “Peter Pan” from our DVR where it had been lying in wait since early December), using iPads, reading books, listening to audio books, playing games. When I texted Nick to tell him that Ella was coming home, he asked if I needed him to leave work to help – I told him that I appreciated the offer, but the girls really weren’t that sick and I had plenty of things around the house to keep me busy, so I’d be fine. Oh, I mean I was fine. It was well and truly fine, really. But those things to keep me busy? BWAHAHAHA. I did manage to do everyone’s laundry and send out a couple of necessary emails, but otherwise… NADA. The least productive home day of all time . I don’t know what kind of vortex pulled me into the living room and onto the couch next to the girls – maybe some weird sort of mostly-sick kid voodoo? – but I accomplished basically nothing except emptying garbage cans when they overflowed with tissues. By the time Nick arrived home at 5:00 so that I could go to the grocery store, I felt like I was seeing daylight for the first time after a prison sentence. Or maybe leaving the theater after viewing Titanic. 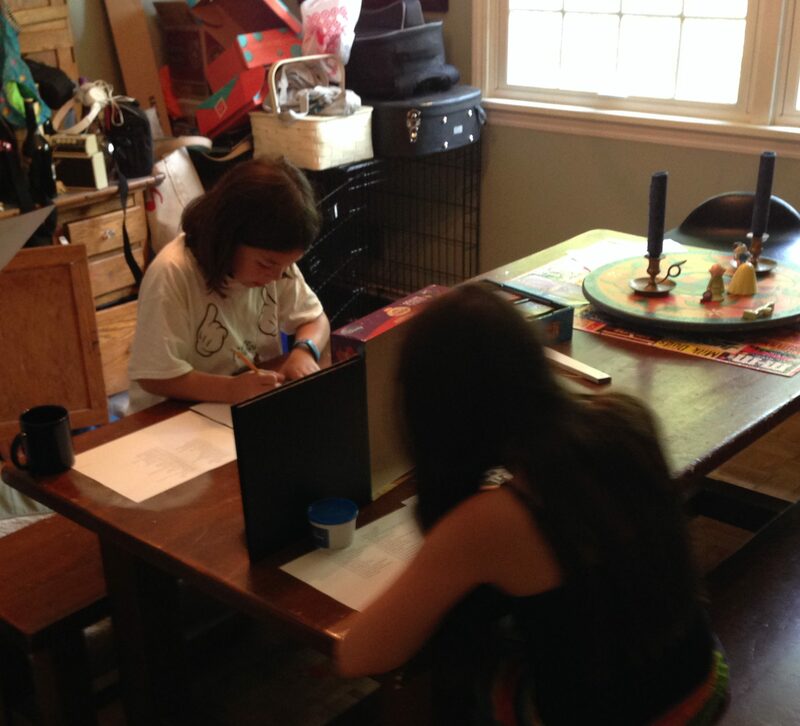 Given that Ella and Annie remained fever-free yesterday, I held *very* high hopes that they would return to school today. This was basically ALL DAY yesterday. Note that the laundry in the basket to the left is folded. BOO YAH. Okay, wait. That’s true, but there’s a caveat. I did hold high hopes that they would return to school this morning, but last night there was a not-so-small part of me that kind of hoped they would be home again today solely so that I wouldn’t have to pack either of them a lunch. Yep. Packing lunches is so odious, I would (almost) rather that the girls stay home sick just to avoid it. IT HAS COME TO THIS. Nick and I agreed that Annie should probably remain home for at least a couple of hours this morning; the last few days, she has sounded so awful after awakening, you’d think she’d escaped from the TB ward. I thought that Ella, on the other hand, was destined for school… until I saw her this morning and she looked even droopier than she had yesterday. When I asked her how she felt compared to the day before, she said she felt the same – or worse – but definitely not better. Meaning that if we opted to send her to school anyway, she would likely just wind up in the nurse’s office again and ’round and ’round we’d go. SO THEY WERE BOTH HOME AGAIN TODAY but with fingers very crossed that they’d return this afternoon. Alas, by lunchtime – the witching hour in terms of taking Annie to class – both girls said they just felt so tired, they didn’t think they could go to school. I don’t think I’m a sucker. I run a pretty tight Don’t-Take-Any-Sh*t ship. But damned if I didn’t feel like I was being played by these little hooligans! It also wasn’t quite as simple as, We’ll just stay home and cozy until you both feel hunky dory, the three of us looking lovingly at one another in the living room – thank goodness there’s nothing else going on! Because I teach piano on Tuesdays. And our awesome babysitter comes and watches the girls. And the students come to the house (where the bronchitis and super-cold germs have been marinating). 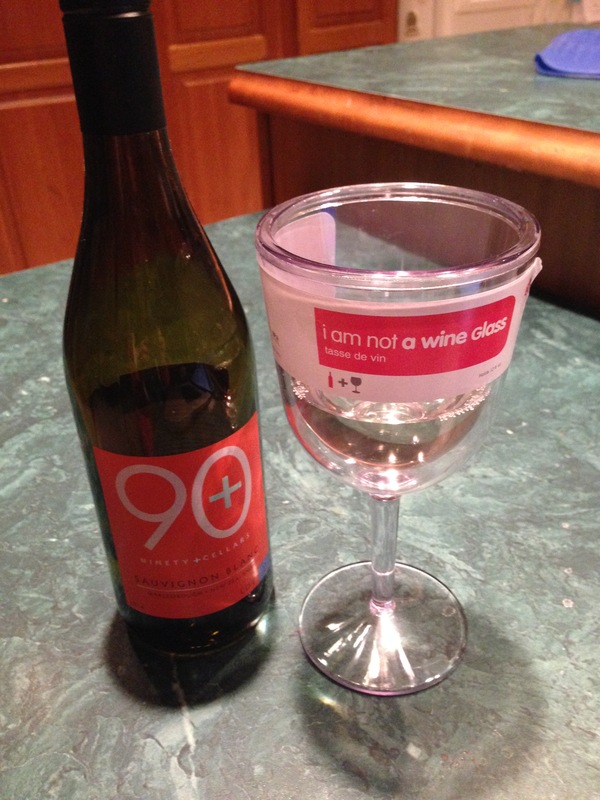 And tonight we were supposed to have my grandmother over for dinner – which, in itself, was a raincheck from Sunday when Annie was first diagnosed. This is the chapter of the parenting manual that is missing. (It’s entirely possible I ripped it out one night while tiny baby Ella was up screaming because we hadn’t yet figured out that she was lactose intolerant and I kept trying make her feel better by nursing her after I’d consumed heaps of the frozen lasagnas and creamy chicken casseroles I’d dutifully prepped before her birth.) How do you make these decisions? 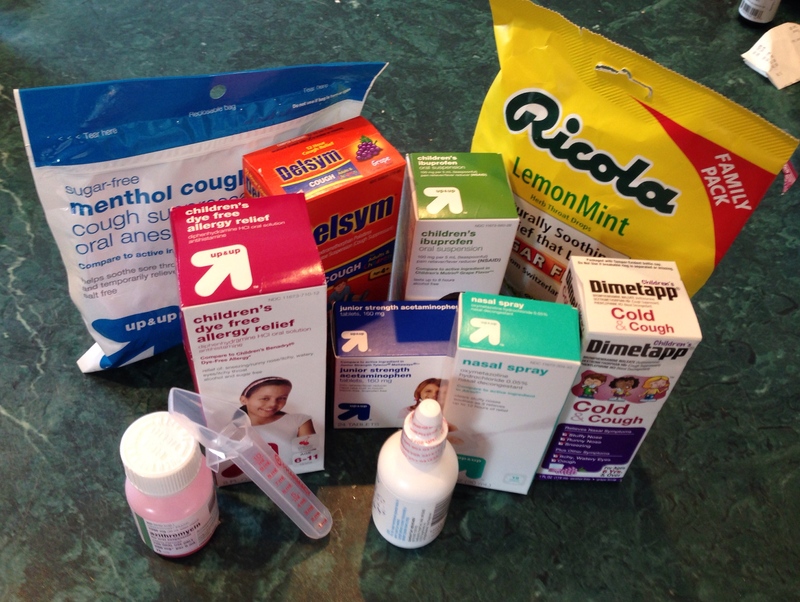 How do you know when your kid is really “sick enough” to stay home, when it isn’t cut and dried? How much do outside factors – job, babysitter, determining just how germ-infested your house really is and if it’s okay for piano students to be in it, desperately wanting to see your grandma but desperately not wanting to potentially give her bronchitis or a cold – come into play? What about missed school days? And how do we weigh in Ella’s chorus concert tomorrow (and missed practices yesterday and today)? My view for much of today: coffee table (clean! 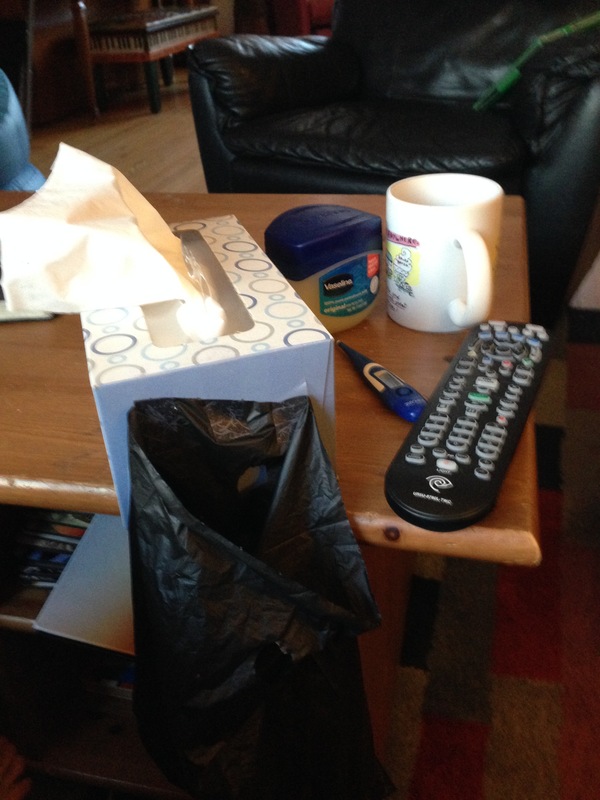 ), vaseline for chapped lips, thermometer, tea, TV remote, and a tissue box to which the girls have taped a dirty tissue bag. So industrious, they are. On the other hand… when it comes down to it, if the kids are sick, they’re sick – period, the end. I mean, how the heck was I supposed to argue with, I don’t have the energy to go to school and I feel the same as I did yesterday… when you decided I should stay home ? Sure, I could have forced them to go in – even refused to pick them up should the nurse call – so that I could teach piano and see my grandma… but in the end, what would it get me? Daughters who don’t trust that their mom is in their corner, who think their mother doesn’t believe them when they say they feel like crap? Teachers who looked sideways at my potentially ill offspring? At few hours of sanity? Okay. That last part was seriously tempting. In the end, we felt that, since they haven’t played this card before (that we know of), we needed to listen to them; they stayed home. I cancelled the babysitter and the piano lessons. Nick and I decided, if we didn’t think it wise for anyone else to be around the girls, that it would be really dubious to ask my grandmother over for dinner — we will take (another) raincheck. 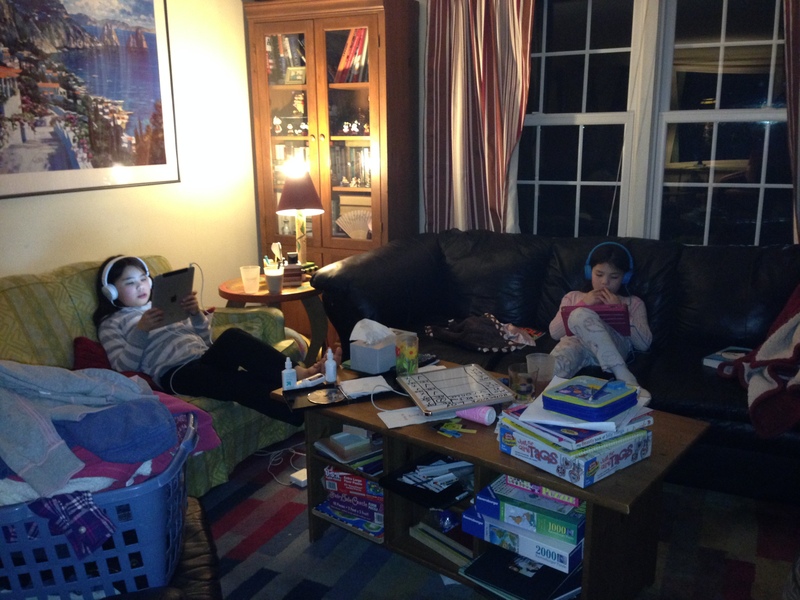 And so it was that the girls and I spent another day at home, cozied up against the winter chill and snow (although not the blizzard that much of the Northeast received) – a sort-of snow day that was not a snow day. (Annie did ask if she could go sledding; that request was quickly nixed seeing how sick she was and all.) There was still television watching and iPad using and book reading, but there was also working out (OH MY HECK I AM SORE), cleaning, photo sorting, and cooking – so it was certainly more productive than yesterday. I will say, however, that shoveling the ice rink – the only occasion I left the house all day – was just about the most glorious experience of ever. Well, that and having Annie try to explain that her knees hurt when she walked because the doctor said she had walking ammonia. And Ella finally getting around to reading some of the books that she hadn’t had time for. As of right now, we are definitely a go to send the girls to school tomorrow. They’ve steadily felt better all day and, given the general level of tomfoolery that they’ve engaged in, I think they’re both as stir crazy as I am to get the heck out of dodge and back to their routine. Maybe best of all, because Wednesday is much-beloved pizza day, I DO NOT HAVE TO MAKE ANY LUNCHES TONIGHT EITHER — can I get an amen! Once the girls are off and running, and after I’ve attended the yearbook meeting, taken photos of the school’s choruses, and climbed a monstrously tall ladder to take photos of every fifth grade homeroom (with the students formed into the numbers 2-0-1-5; it’s as brutal as it sounds – send good vibes, please) — but before Ella’s chorus concert tomorrow night — I plan to sit down with that parenting manual to see what we might have done differently, ’cause this stuff is hard. If you’ve got the missing chapter, I’m all ears.